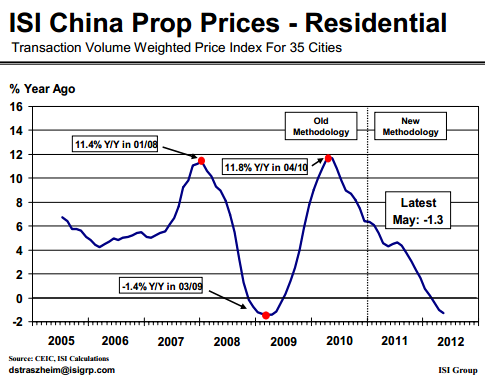 China's residential property values are continuing to decline. The chart below from ISI Research shows that the rate of decline is now similar to the lows in early 2009. And data from ISI tends to be more accurate than the official numbers coming out of China's housing ministry. But make no mistake about it - much of this decline has been engineered by Beijing, as they attempt to arrest the housing bubble. Reuters: - An unnamed spokesman from the housing ministry was quoted as saying that "all localities must firmly implement various property tightening measures as required by the central government." In spite of this being an "unnamed spokesman", such policy directives are fairly common. And this particular directive is not at all surprising. Beijing is sending a stern message to local authorities to keep the measures place. However as the nation undergoes an economic slowdown, which may end up being more severe than the authorities had anticipated, the tightening measures in the housing market may be relaxed (particularly at the local level). Reuters: - ... the weakening economy, likely to grow at its slowest pace in more than three years this quarter, is fuelling expectations that Beijing will probably have to relax property curbs if external headwinds worsen. Reinforcing such expectations are local governments' steps to make it easier for first-time home buyers, by relaxing policies marginally so as not to irritate Beijing while stimulating local housing transactions. The local governments have profited tremendously from the housing boom and will do whatever they can to prop up sales and prices. There is some anecdotal evidence that home sales have indeed been brisk. But given the high levels of unsold inventories, any material increases in prices from this point are unlikely. Reuters: - ...high inventories will cap any quick rebound in home prices in the near term, [China Securities Journal] cited Home Link analyst Chen Xue as saying. Vanke, China's largest developer by sales, said earlier this month it would take about 11 months to sell down unsold stocks in key cities such as Beijing, Shanghai and Shenzhen. "I'm not worried about a home price rebound as long as the government keeps its tightening stance," Hui Jianqiang, head of research at the China Real Estate Association, told Reuters after the data.